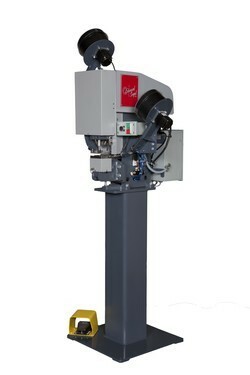 The Edward Segal Inc. Model 4KGW is the most advanced grommet machine in our product line. 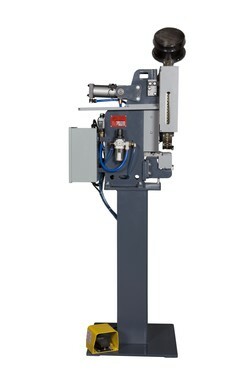 This machine utilizes pneumatic force and innovative toggle linkage to generate over 4,000 pounds of force; plenty of power to cut through multiple layers of the toughest fabrics. The 4KGW has fewer moving parts than the mechanical grommet machines to simplify maintenance issues. To offer maximum flexibility, it comes standard on a machine pedestal but is available on a fixed plate for bench mounting or a mobile stand with casters. A PLC based electronics package provides control over the individual functions of the machine and offers a platform for expansion. · Bench: 25" x 32" x 36"
· On Stand: 29" x 32" x 68"
· Bench: 310 / 400 lbs. · On Stand: 380 / 580 lbs. Electrical: 115 Vac, 60 Hz, 1 Ph.